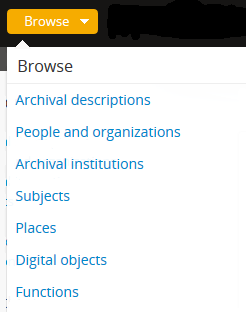 The digital object browse page currently includes a set of buttons, that work similarly to the “Media type” facet filters available in the archival descriptions search and browse pages. 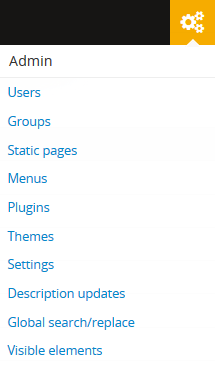 A user can toggle them by clicking to limit the results by Media type (image, text, video, autdio, or other). 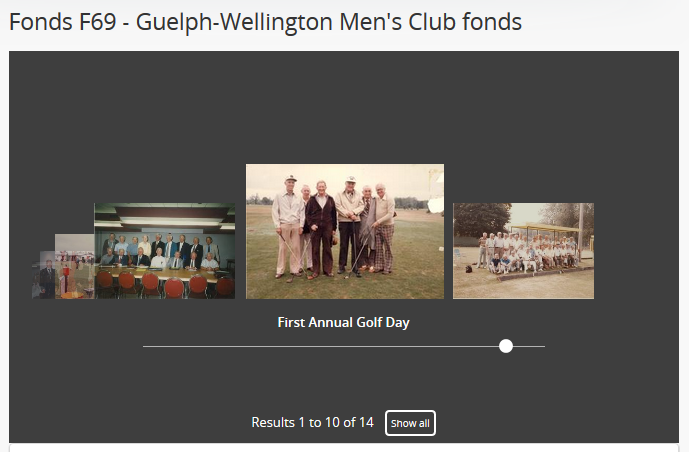 The media type is drawn from the “Media type” field available on a digital object edit page - upon upload, a type (based on MIME type) will be automatically assigned, but a user can edit the digital object to change its type if desired. 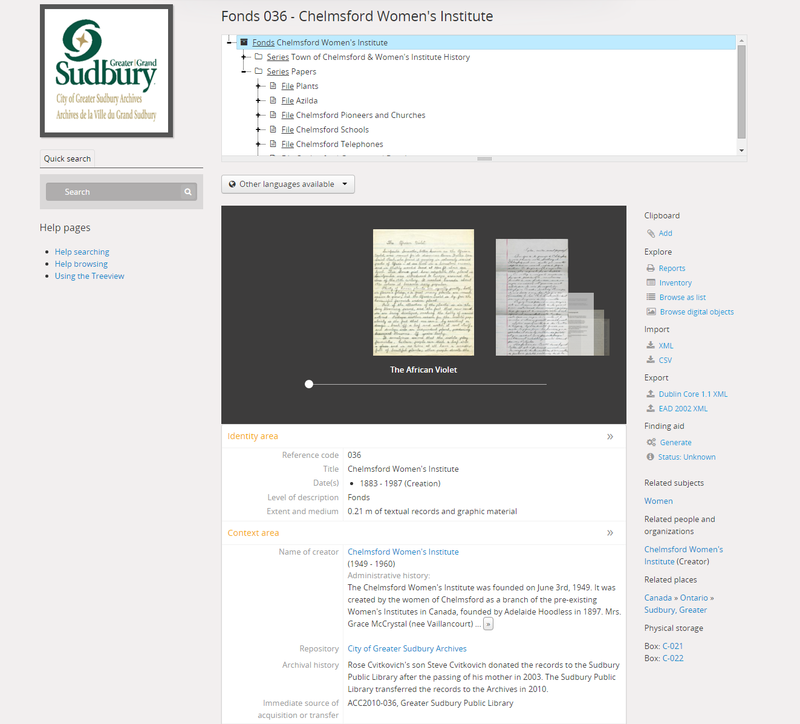 More: Only available on archival descriptions and accessions. Reveals several further options. On archival descriptions, these include: Rename, Update publications status, Link physical storage, Link digital object, Import digital objects, and Create new rights. See: Rename the title or slug of an archival description, Physical storage, and Upload digital objects. If a digital object is already linked to the description, “Edit digital object” will be available instead of the link option - see: Edit digital objects. If rights have already been added to the description, the option to “Manage rights inheritance” will be available in addition to Create new rights - see: Manage rights inheritance. 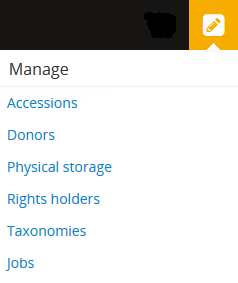 On accessions, the More menu includes the option to create new rights - see: Rights. 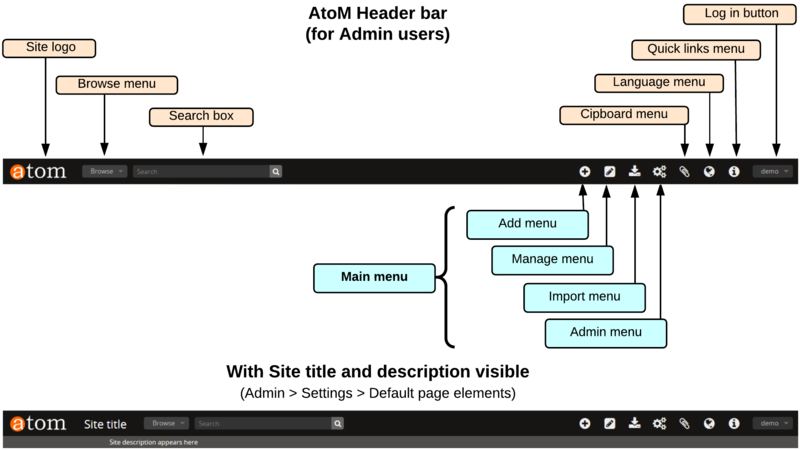 The sort button is a navigational element that appears on some browse and search pages throughout AtoM. It allows a user to change the sort order of the results being displayed. Common values used in the sort button as it appears in AtoM include: Alphabetic, Identifier (or reference code), Most recent, or Date. 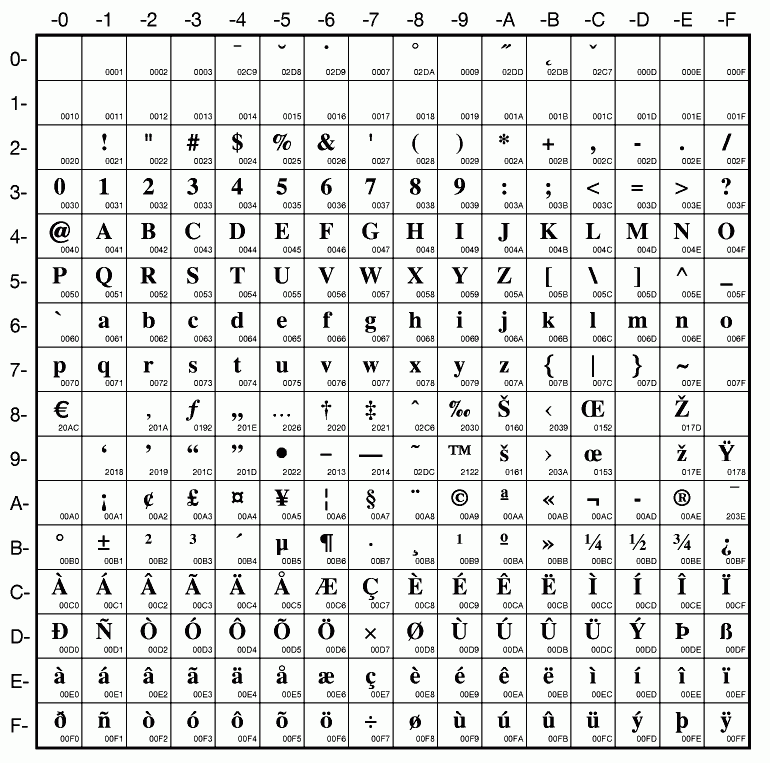 When the sort order is set to “Identifier,” (or “Reference code” as it is labeled on the archival description browse page), results are displayed by the identifier, based on an alphabetic ASCII sort (more information on ASCII sort is included in the IMPORTANT note below). On archival descriptions, the sort order is based on full inherited reference code, and NOT on the individual identifiers of each record, regardless of whether or not reference code inheritance is turned on in Admin > Settings or not. For more information on reference codes vs. identifiers and display options, see: Inherit reference code (information object). 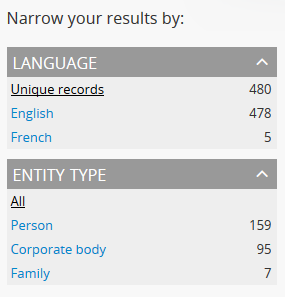 When the sort order is set to “Date” (currently only available on archival descriptions), AtoM will order the results by the internal, ISO-8601 formatted (e.g. YYYY-MM-DD) start date values - not the display date shown to public users, which is a free text field allowing users to express approximation or uncertainty. Results without a start date value will appear last.